Whether you are searching for an electronic dog or cat fencing option, we have all your pet fencing needs! Take a look at some of our Sample Pet Fence Layouts.When having an electronic fence installed the wire must be installed in a continuous loop to close the electronic circuit. 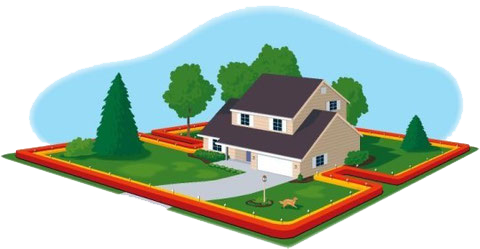 Every yard varies in shape and size but the most typical layouts of pet fence installation are shown below. Not just for outdoor containment, our technology can easily keep the kitty off the kitchen counter, the dog out of the litter box or your animals out of the formal area in your home. Chose a wireless or custom-wired solution to best fit your needs. Our customizable dog fence and cat fence can de designed with diverse zones and settings, and is buried out of sight to maintain the beauty of your property. The most common installation is a Full Perimeter Loop. This is where a wire is installed completely around your property giving your pet free range of your yard. 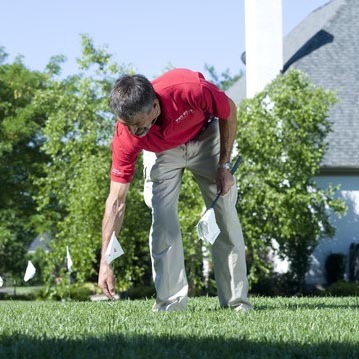 The second most common installation is what is called a figure 8 or a Pinch. 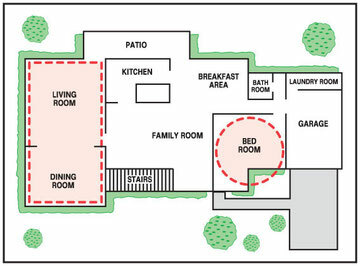 This is where the wire is installed around the property just like the Full Perimeter Loop only with a pinch in the middle creating two zones, a front zone and a back zone. When you are looking to have one zone such as only a front yard fenced or only a back yard fenced, we often install what we call a Double Loop or a Banana Loop. This is where the wire is installed around the area you are looking to contain then brought back the same way creating the double loop. With our experience and technology we create the best, permanent solution for you and your pet. 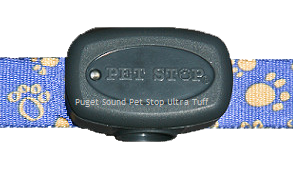 Puget Sound Pet Stop dog fences offer a suite of unique and Patented Features to meet the needs of any Dog Breed. 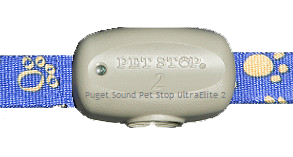 Our dog fence collar-receivers have 3,000 settings to completely customize your dog’s receiver to meet their individual needs. This makes our dog fences the Most Advanced, Most Humane pet containment solution on the market! 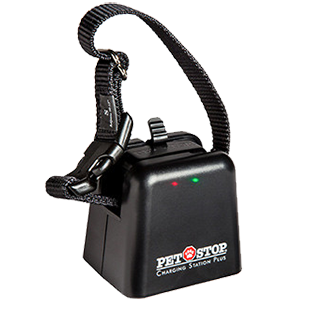 Once your Pet Stop® pet containment system is installed, correct perimeter training of your pet is of vital importance. 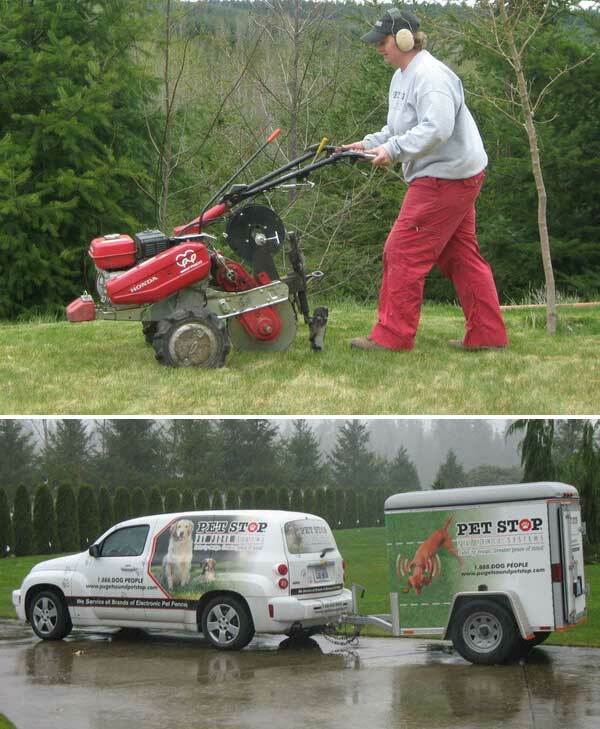 That is why Puget Sound Pet Stop pet fence installers are professionally trained and certified dog handlers to assess your pet’s individual needs. 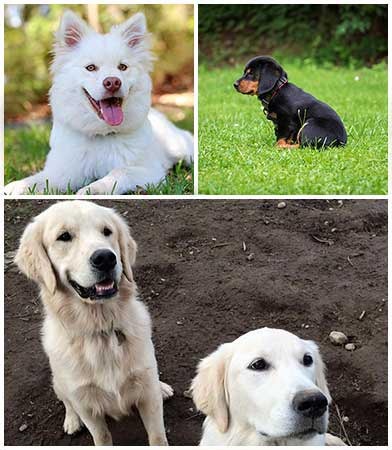 We provide a minimum of three GentleSteps™ training sessions for each dog or cat on the system. We offer FREE training for the first 90 days after the installation, if your dog or cat requires additional training – We will come out and provide additional training FREE OF CHARGE. Keeping your Dog safe at home is what we do best. We Guarantee it! If we can’t meet the needs of your pet and keep them safely contained, we will refund your money. All dogs are unique in their own way. Just like you, they have different needs when it comes to pet containment. That’s where we can help. With our experience and technology we can create the best, permanent solution for you and your dog. We’d love to come out and evaluate your dog, listen to your needs and give you recommendations for a dog fence. We’d love the opportunity to come out and meet your cat, evaluate your yard, and help you customize an Indoor and or Outdoor system that is right for your cat and space. We offer features that are purrfect for cats. 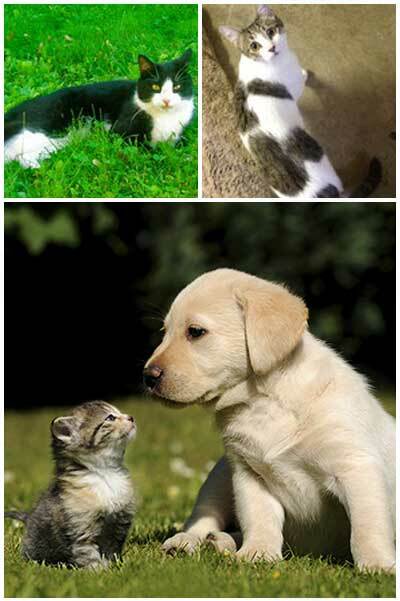 Since cats are smaller, it is important that the receiver be small and light. In addition, it is important that the installation be done carefully so that cats don’t escape from the yard by climbing trees or sheds. We can get creative with your outdoor cat fence ensuring your cat will remain safe in your yard. 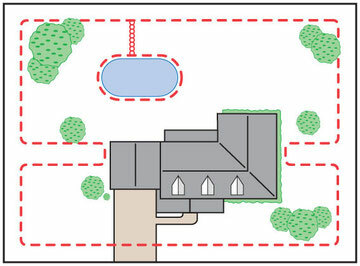 We can also create safe zones with an indoor cat fence creating cat free zones within your home. Cats are unlike dogs in so many ways that is why Puget Sound Pet Stop has a unique method for training your cat. We will start the process of training your cat, we then provide you with training hardware and a training manual to ensure your cat learns quickly and effectively to stay within their boundaries. We come back in a few days after your cat fence is installed for follow up training. We offer FREE Training for the first 90 days after the installation so if your cat needs additional training, we will come out FREE of charge. If you live on a narrow lot, and want to incorporate boundaries around narrow walkways or possibly setting boundaries around gardens or flowers beds, Pet Stop Pet Fence System’s ability to have low setbacks is a Purrfect feature for you and your cat. The Pet Stop Brand of Pet fence Systems differentiates itself from it’s competitors by engineering and offering a number of patent features making Pet Stop the Most Advanced and the Most Humane pet fence product on the market. 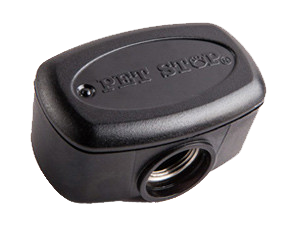 All our products are MADE IN AMERICA BY Perimeter Technologies, Inc. the manufacturer of all Pet Stop® products. You will also be provided a training manual outlining in straight forward terms the principals and methods involved to reinforce the initial training. et Stop® has collars specifically designed for puppies, rescue dogs and the timid dog in mind. These collars include GentleStepsTM training technology. It’s no hassle and simple features allow the customer to manually set the training levels as your dog progresses offering a safe, gentle approach to training your dog. Our trained pet professionals will guide you through the training process to ensure the most effective and most humane training for your unique pet in mind. 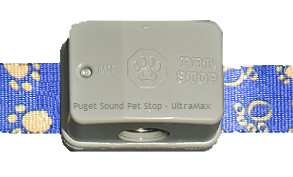 Puget Sound Pet Stop’s philosophy is to provide maximum containment using the minimum amount of correction required. Rocky was the runt in a litter of 7 puppies, his parents were two Pet Stop dogs on Lake Tapps, Cody an Australian Shepherd and Lucy a Border Collie. 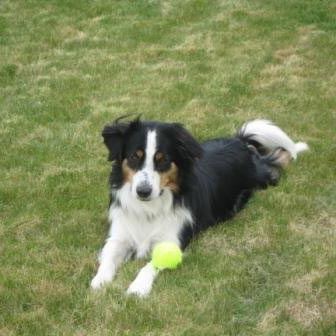 Rocky was brought home @ 7 weeks old and began his pet stop dog fence training at 8 weeks with GentleSteps. 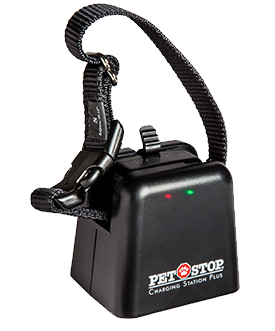 He has gone to work most everyday with the Pet Stop team proving himself to be a useful training tool. Rocky has had many on-site training hours, he is often an essential part of our training process with our dog training. Below are Rocky’s most common training techniques. A herding breed by nature, Rocky knows on command to corral a dog back on track. Rocky often plays with hyper dogs and puppies to wear them out a little to give them the opportunity to be more focussed in their training sessions. Rocky is used as a playmate in the “safe areas”, showing dogs they can still be outside and have fun in there new yard. Rocky is often used as the final attempt to create a distraction by enticing your dog to test or cross the boundary. I have three dogs on this fence they have not tested it since training. It has been almost 2 years. My little Cairn Terrier Ruby, my Beagel Jacob and my Puggle Gracie are all major wanderers. This fence is the greatest thing I have ever bought. Rubys battery has been dead for 2 weeks, she still has not left the yard. I love my fence and my dogs too. Thank You Tammy and Debbie. Great company with people who genuinely have the dogs and customers best interest at heart. Hard working, very reasonable. The product is top quality. Designed to take what most dogs can dish out, incredible chew resistant collar. Light weight and weighs only 1.3oz, universal settings for most any breed. Includes puppy and stubborn dog features. The lightest, smallest receiver ever made and weighs only .8oz. Rechargeable – Eco-Friendly. Perfect for small breeds and cats. The smallest and lightest receiver available. – No other competitor can offer this light weight, highly effective collar. With its unique settings, less than 1oz. in weight and rechargeable battery – We guarantee it will contain any breed, or your money back. Have questions about any of our products? Our friendly team can't wait to help you!